Faking Autism Diagnosis - "Parents are seeking the autism "label" because funding for the condition has increased and more assistance is available for autism than for other conditions." Autism: "A Popular Fad Diagnosis" - "The most likely cause of the autism epidemic is that autism has become fashionable – a popular fad diagnosis. Once rare and unmistakable, the term is now used loosely to describe people who do not really satisfy the narrow criteria intended for it by DSM IV." These articles ruffled quite a few feathers actually. For good reason. For parents who are absolutely certain of their child's diagnosis, it's insulting for autism to be called a "fad." I am certain of The Boy's diagnosis. Hearing it wasn't a surprise. But I've spoken to other parents who have said their child was given an autism diagnosis (by medical professionals) just so that their child may get the services. Even when The Boy was going through all of his initial evaluations, I heard The Boy didn't really need physical therapy. But I was told, "It's better to have it and not need it than to need it and not have it." I think this seems to be the general consensus when (mis)diagnosing children with autism. As parents we want the best most appropriate services to help our children succeed. Except those services are dictated by diagnosis. So if your child has a Learning Disability or mild Intellectually Disability - an Autism diagnosis/classification may be the way to go. 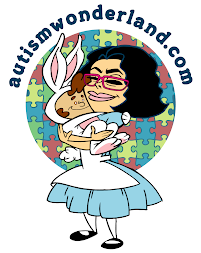 Simply because autism is the magic word for receiving necessary services. Classifications never really bothered me until recently. As I went through the Turning 5 process I began to understand the significance of proper classifications. And now, with The Boy in a specialized Kindergarten program, I realize how critical an accurate diagnosis/classification is. As I was touring schools last year, I heard a lot of "We accept children with an autism diagnosis, but we do not accept the autism classification." How does this even make sense? It was explained that while some schools accept children with a medical autism diagnosis, the classification on their IEP must reflect something else - usually Learning Disabled, Speech Impairment or Other Health Impairments is assigned. This leads me to wonder whether or not these children are actually on the spectrum. Are these schools simply accepting the "easy" autistic kids? And so, when I look at some of the children selected or rejected for the Horizon program, I have doubts. When I look at the children going into, not accepted to or being counseled out of the NEST program, I have questions. Does the Department of Education understand autism? Are they prepared to handle this population of children who need specific teaching methodologies and therapies (Occupational and Speech). I get that autism is a spectrum, a complex neurological disorder. But aren't there consistent commonalities? The New York Department of Education seems to be creating these programs for children with autism, however the children selected may not have an autism diagnosis. And the programs sound great in theory, but when put into practice there are too many loose ends and not enough education or staff support. When The Boy's teacher told me on the first day of school that The Boy "didn't want to make friends," I was taken aback. Because the class is supposed to be for children with autism. And typically children with autism lack the "ability to socialize or form relationships." When a child is misdiagnosed with autism and goes into a classroom environment with children accurately diagnosed with autism - the perception of autism becomes skewed and the reality of the diagnosis becomes compromised. The saddest part about all of this is that, it's all done with the best of intentions. But somewhere along the way, there is a huge disconnect. And children are left behind.